It will come as no surprise to note that the Nicklaus golf course at St Mellion Golf & Country Club is the course that Jack built, his first European course design. This is the place to come if you really want to test your game. The recently refurbished (2009) onsite Hotel and Country Club complex has great facilities and is geared up for visitors. The Nicklaus course opened for play in 1988. The great man was clearly happy with his creation and said: “I knew it was going to be good, but not this good - it's everything I had hoped for and more... St Mellion is potentially the finest golf course in Europe”. The course was good enough to host the Benson & Hedges International Open for six years from 1990 until 1995 with Olazábal, Langer and Ballesteros amongst the winners. St Mellion is located in the Tamar Valley, on what was once rolling farmland. Bodmin Moor is not too far away but you need look no further – the beast is the Nicklaus course. Generally, the course is in excellent, American-style manicured condition, with plenty of definition between the sculptured fairways and the first/second cuts of rough; similarly with the greens and fringes. Elevated tees provide a good view of the task in hand. Keep the ball in play, there’s plenty of bunkers and loads of water. There is no doubt that this is a great golf course and bears the hallmark of a designer who pays attention to detail. Many of the greens are multi-tiered and the hazards are strategically placed, making for intimidating tee shots. The fairways used to get waterlogged but extensive drainage work has resolved that problem. 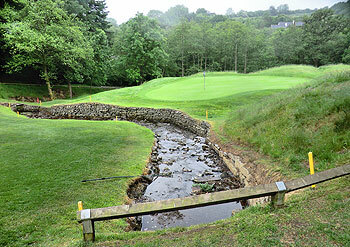 There are no easy holes at St Mellion but there are many memorable ones, each with its own individuality. The 11th hole is an exacting par three measuring 203 yards; from a high elevation, the tee shot must carry across a river that wends its way across the front and down the left hand side of the green. No prizes for being short here. Our favourite hole is the par five 12th, running through a tree line valley. A stream meanders all the way along the right and then cuts back in front of the green before continuing on its way. The lower handicap golfer will enjoy this exciting course enormously, but if you are having an off day, you will succumb to the beast of St Mellion. It will be interesting to see how the best European pros fare at St Mellion when the English Open returns to the European Tour schedule and is staged on the Nicklaus from 2011 for five consecutive years. I've played St Mellion a couple of times and feel that it has gone from over rated to under rated due to its American resort style nature and the fact that you really should use a buggy, normally a massive negative for me. Make no mistake, as the other reviews say this is a super tough golf course where you can easily lose a bag full of balls but still walk off smiling. Some blind shots, forced carries over water and chasms, danger at every side, big slopey greens, random humps (thanks Jack!) and plenty of length. Have played as a pair and as a society, and both times all enjoyed the course immensely. The beauty comes maybe from its location more than the design, but it's a fantastic value course when either staying at the course or hiring a house in the grounds as a group. Highly recommended, particularly as a stay and play stop over on the way to the many outstanding courses further West. Played St Mellion as part of a short Cornwall tour in Oct 2015. As mentioned in the description on this site the course is in excellent condition, particularly the greens, which were perfect, and surrounds which were precision cut. Certainly a course for the mid-low handicap golfer with some tight driving holes, carries of water and punishing rough. Based on its ranking (63rd in England) the course exceeded my expectations by a long way. Its potentially a top-100 UK course and should be ranked above Trevose in Cornwall (in my view). I'm a big fan of links golf but maybe theres some pro-links and anti-resort course bias that counts against St Mellion in these rankings? All a matter of opinion of course and we were fortunate to play on a sunny day when the course didn't seem to be particularly busy despite it being a Saturday morning which all helps. Wherever its ranked I would highly recommend to serious golfers visiting this part of the UK. Whilst not the best course I have played (Carnoustie) it is certainly one of the toughest, any wayward shots are punished, it reminds me of the Dukes course at Woburn, but more unforgiving.There are some truly memorable holes such as the short 5th which requires a mid to long iron to get across the water (longer club from the whites required) and that leaves a short iron to the narrow elongated green which has a ditch at the front and a large bunker at the back. Or the par 3 11th, down hill over water to the green, you must choose the correct club.It is a long course to walk with often large distances between green to tee and these can be uphill or downhill and is one of those courses suited to using a buggy.In summary if you are in the Devon, Cornwall area, add this to your list! The Nicklaus is a very tough test of golf from whatever blocks you play it from. It examines every facet of your game and has as tough a finishing stretch in 15,16,17 & 18 as any course I've ever played.You make your score on the front and then hang on a little through the back as it is brutal! My personal favourite hole on the course is 5 and proves that golf holes do not need to be 400 yards plus to be great.A word of warning- uphill putts are the order of the day as I watched my playing partner 5 putt the 7th! As I said, this course is a brute. Whilst being an attractive layout, it's not exactly golf for the connoisseur. It's typical Nicklaus, i.e. it's tough and places far more value on ball striking than shot making. Ultimately it's an 'international style' (please stop referring to these places as American) resort course and, whilst it's a good example of that particular version of golf, real players would be far better off avoiding this conveyor belt and heading to St.Enodoc, Trevose, Perranporth, Mullion, Bude or any other of the superb courses in this part of the world. St Mellion is what it is and I'm afraid you can't get away from the fact that the end result is a five hour round on heavy, farm like soil. Head to the sand dunes and experience the pleasure of golf on fast draining, running, sandy soil. You might even find somewhere to stay which has a bit more character than you're likely to find at the resort. Having played all the courses in Cornwall many times, it is unfair to compare St Mellion with any of them. Play them all if you like sight seeing, if you want to play the best and toughest golf course ever, look no further than St Mellion. From the first shot to the last putt, this is an unprecedented test of both physical and mental ability to play golf. The best golf course you are ever likely to play. What is an International style course? I have a rough idea what an American course may be. Whatever, there is no doubt the Nicklaus course is indeed a great days golf, and I go to Perranporth every year and I love it, this is just different, and no worse for that. As a lover of clubs like Liphook, Alwoodley, West Lancs etc... I wasn't really looking forward to a lads few days away at this mighty resort course, but it delivered. Fair play to Jack, he knows what the golfer likes. Wouldn't bother with the Kernow course again though. And it is a 5 hour round. The course is better than it's ranking, in my opinion more fun and enjoyable than Celtic 2010, Woburn Marquess and The Belfry. i totally agree, I've played here twice now and with the new hotel it really scores. Some unique holes in challenging topography. Take plenty of balls. Just in case! Another example of big, bold Jack Nicklaus course design where there is almost no let up in challenge from first to last. I found St Mellion did at least offer some subtlety and variety unlike the Nicklaus-designed PGA Centenary course at Gleneagles, which I played in 2011, prior to its pre-Ryder Cup changes. The 3rd fairway, 4th green and each of the 307 yards of the 5th demand precision, thanks to water hazards which feature on many holes. The lake at the 18th looks far smaller than when shown on television during the 1990s when the course hosted a European tour event. However, it is still a sufficient menace given the narrow entrance to the green and the various run offs. In contrast to the need for precision, many of the long holes permit (or demand) a lusty blow with the big stick. The ability to hit the ball both ways is also helpful with the numerous doglegs. The conditioning throughout is of high quality and some of the holes are outstanding, although this should be no surprise given what appears to be favourable land. My apologies if this was not the case at time of creation. However, the 9th still has the look of a placeholder, similar in design to many holes of the visitors’ course at the London Club (The International). St Mellion is a big test especially when playing it on a windy, damp and grey Sunday afternoon in June. Playing it in afternoon sunshine would have given me a better impression but regardless of that, the top notch challenge and conditioning are there for all to see. Played here last week in wintery conditions and strong winds. Even without this weather, this course would still be BRUTAL! The course was fantastic despite the greens being poor (we were warned in advance that the lack of rain meant they had not yet recovered from the work they had done).Every single hole has been well thought out requiring you to hit all manner of shots - high, low, left, right. Whilst at times i thought the challenge was almost overdone (does every single hole accept 3 or 4 require a water hazard), i would quite happily play here every single day and enjoy the challenge.Holes 11 and 12 are two of the most beautiful i have played.If near this venue, do not avoid it, you will not be dissapointed. Played this course last week as a guest of a member, having previously played it once before two years ago. As a mid handicapper (16), I would say that the course is punishing. The length is not a major problem but there is a huge premium placed on being straight off the tee. The fairways are very narrow in parts and huge mounds line the majority of the holes. Anything wayward will likely be lost, in a hazard or played from deep rough on very sloping lies. However this is not a criticism as the course is not unfair but merely tough. The front nine and around the turn have some very beautiful holes, (particularly 11 and 12) but the last six in my opinion are not as interesting. The greens were quite bumpy but the course was generally in very good condition. Well worth playing this and it's sister course The Kernow on the same site.